Richard Wagner dispatches the god Wotan, his most complex, conflicted and, therefore, fascinating character in the Ring, on the penultimate day of the Tetrology. On day three Siegfried, the troubled god, traverses the earth’s ‘broad back’ disguised as the wise and weary Wanderer. The lumbering young lummox of a hero that RW created in Siegfried splits the old man’s spear in two, destroying Wotan’s powers. He retreats. From then on it’s down to his daughter, Brunnhilde to sort out the ensuing mess. This has always struck me as an eccentric bit of story-telling: create a charismatic character, make us think it is his story, then get rid of him. Any Hollywood script guru would tell you this is dramatic folly. Nobody would dare change a note or syllable of the old German genius’s epic, of course. 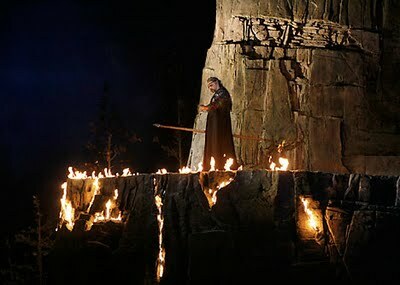 But in Seattle’s third outing of its 2001 ‘green Ring’, Greer Grimsley’s tireless, commanding Wotan/Wanderer dominated the cycle—despite that third day departure. When Grimsley first sang the role in the 2005 Seattle production, I was struck by his secure technique, stamina, vocal power and beauty of tone not unlike that of the great George London. This was a world-class performance, so Covent Garden please take note: next time Bryn Terfel pulls out of a Ring because his kid has broken a finger, try calling on this great American bass-baritone. And then as Fricka there is Stephanie Blythe —probably the finest mezzo-soprano singing on any opera stage anywhere in the world today. Had Wagner given the Goddess of marriage and family a greater presence in the cycle this Ring would have been Blythe’s. 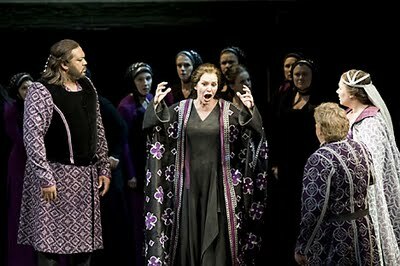 Seattle made the wise decision to make the most of her glorious, lush, sumptuous mezzo and dramatic presence by bringing her back as the Götterdämmerung Waltraute and even as Second Norn. There were some significant newcomers to Ring roles this year , the most important being the arrivals of the American Janice Baird as Brunnhilde and the Danish Stig Anderson as Siegfried. The tall, slim Baird looks wonderful and is a fine actress; she has spectacular high notes and can create great dramatic excitement. She was, however, let down by a wobbly middle range and some off-pitch singing, most notable, alas, in the Immolation scene. Stig Anderson had been indisposed by a viral infection during the first cycle but had soldiered on. By the time I saw him in the second cycle his performance went from a worrying, weary-sounding start in Siegfried to a magnificently sung death scene. That’s quite an achievement in this thankless role that makes so many vocal demands but provides so few dramatic rewards. Another key newcomer, Australian Stuart Skelton made a stunning debut as a lyrical, romantic and youthful Siegmund, his voice ideally suited to the role. San Franciscan Denis Petersen’s first Seattle Mime was also a magnificent debut. 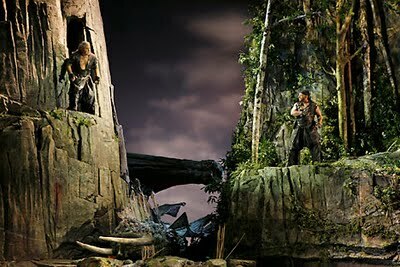 It is a tribute to the immense acting and singing talents of Petersen and the returning Richard Paul Fink as Alberich that the comic scene between the two wretched dwarfs in the second act of Siegfried was one of the most memorable of the whole cycle. Kudos also to Chorusmaster, Beth Kirchhoff . 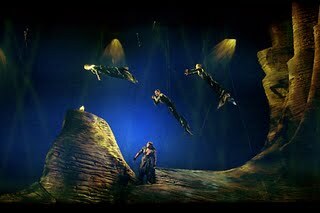 The great male chorus of Vassals in Götterdämmerung, Act 2 sounded fantastic: virile, powerful and they acted well too. Robert Spano, returning to the Seattle Opera pit for his second Ring since 2005, gave us a sweeping, lyrical Ring let down just occasionally by some erratic French horns. Director Stephen Wadsworth and designer Thomas Lynch have made few changes to their production. The ‘back to nature’ theme, so appropriate for the Pacific Northwest setting, remains a refreshing response to the many and varied, and invariably ugly European ‘concept’ Rings. One small quibble, and it takes us back to where we began with Wotan and Fricka: the Seattle team have decided that Fricka is not a shrew. That’s fine—Patrice Chereau came to the same conclusion in the Bayreuth Centenary production in 1976. But for my taste, Wadsworth has taken this idea a step too far. Wotan and Fricka constantly smooch, caress and gaze so moonily and sappily at each other that this writer started to wonder if they might not be better suited to a weekend at a Sandals resort for couples instead of going to live on Valhalla. But it’s a small flaw in what remains probably the loveliest Ring to be seen anywhere in the world. G.Grimsley, S.Blythe, RP Fink, M.Plette, A. Silvestrelli, G.Hawkins, K. V. Rensburg, J. Collins, M. Streijffert, D.Petersen, S Skelton, MJ Wray, J.Baird, S. Andersen. Dir: R.Spano. Dir.esc: S. Wadsworth. Designer: T. Lynch 17,18,20, 22 August.